Democratic presidential candidate Hillary Clinton has a plan to fight ISIS online, and it’s only marginally less impractical than the crackpot censorship strategies suggested in Congress. 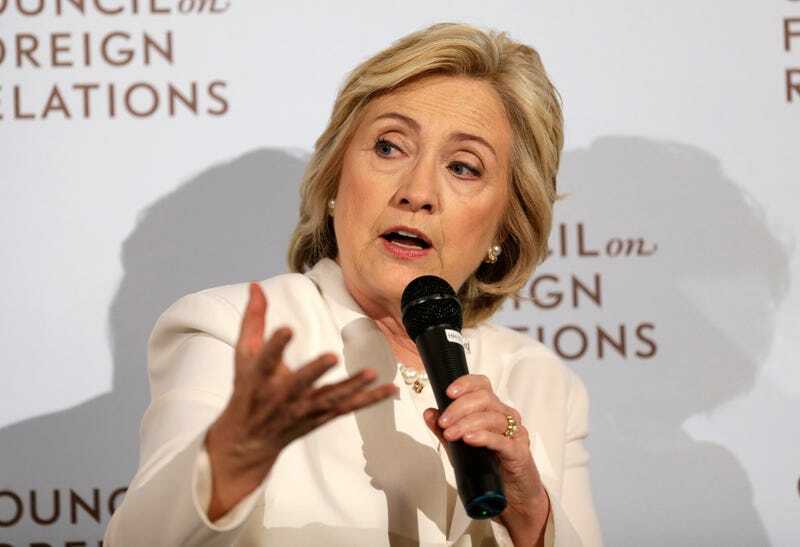 Clinton talked about ways the US could be more aggressive with ISIS online in a speech Thursday. Her digital strategy has two main components. The first part makes sense: Clinton wants to expand a State Department program to track terrorists’ recruitment strategies online. OK. Good start. The second prong of her plan goes off the rails. “Social media companies can also do their part by swiftly shutting down terrorist accounts so they’re not used to plan, provoke, or celebrate violence,” Clinton said. Taking down social media accounts is the same strategy Anonymous is using in its “war” against ISIS, and it’s not the right one. Clinton wants social media platforms to get better at kicking terrorists off their networks, but companies like Google, Facebook, and Twitter have already been actively monitoring and booting suspected terrorist accounts. “There is no place for terrorists on Facebook. We work aggressively to ensure that we do not have terrorists or terror groups using the site, and we also remove any content that praises or supports terrorism,” a Facebook spokesperson told Gizmodo. Of course, they could hire more employees to proactively find terrorist accounts before they get flagged by other users. But on pseudonymous platforms like Twitter—which is one of ISIS’s favorite recruiting tools—a suspended account is a measly roadblock. A terrorist with a suspended account can simply make a new account in seconds. Clinton didn’t provide any specific instruction for how to make account take-downs more effective—because there really isn’t any. That’s why abusive accounts on Twitter remain such a problem. There’s no easy way to stop someone from signing up for a platform designed to let anyone sign up without fundamentally changing how it works. The Islamic State uses the internet as a potent communication and recruitment tool. It’s a serious threat, and one that every presidential candidate and member of Congress should take seriously. Yanking ISIS accounts, however, is not a viable strategy. And pretending like it’s a vital step shows just how lost politicians like Clinton are as they assuage worried voters.